I’m fresh from the Forecast tour. I use the word ‘tour’ lightly, though I did travel 1,300 miles, got stuck in Seattle overnight, and was detoured by a road closure on the drive home. A few days and states later, I feel very toured. 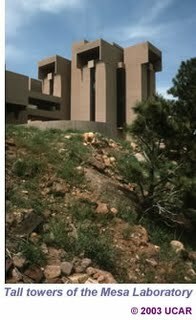 But the journey was worth the travel: Last week, Forecast — the Tracy Weil-Drew Myron art-poetry exhibition — opened at the National Center for Atmospheric Research in Boulder, Colorado. Designed in the 1960s by I.M. Pei, the Mesa Laboratory is a collection of abstract, geometric concrete forms perched atop the highlands and in the shadow of dramatic red sandstone formations known as the Flat Irons. It's a stunning setting for our abstract, horoscope-inspired art. And, as a glutton for press, I am delighted with the attention from Westword and the Colorado Daily. Read all about it here and here.